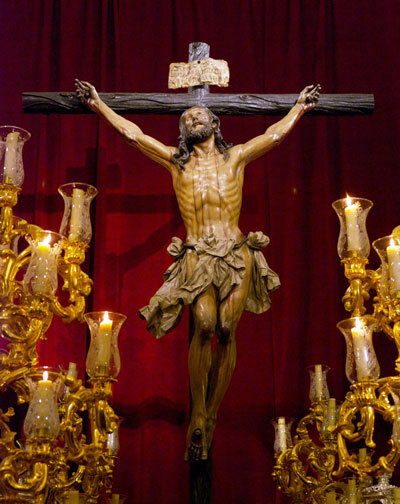 Cristo de la Expiración, called "El Cachorro." This image is by Francisco Antonio Ruiz Gijón (1682). 1. El Gran Poder y La Macarena Just a few video clips of these most-beloved devotions, which were not able to do their penance this year because of the weather. 2. Wednesday: La Sed We see the procession pass in front of the Seville city hall. 3. Wednesday: El Baratillo A particularly beautiful evening procession; watch out for the shower of rose petals onto the second paso. 4. Saturday: El Sol A complete procession as it leaves the Cathedral after being trapped inside by the weather. Fittingly, El Sol came out when the sun did. 5. Sunday: La Resurrección The 4:30 a.m. Easter Sunday procession of the Resurrection, presented in its entirety from two points of view: first from the street of the Divina Pastora in front of its church and then at the Alameda de Hercules. In the Alameda video, be sure to catch the special action of the costaleros—the men who carry the bier—of the first paso. There are also photos in my Gallery.